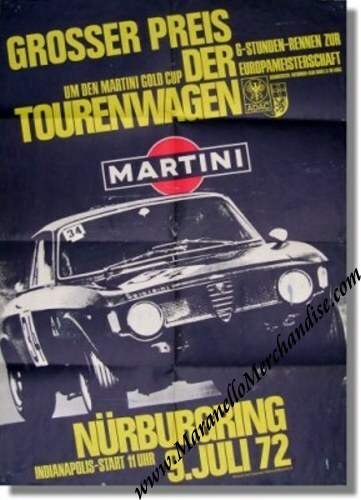 A great and vintage original poster for the 1972 edition of the Grosser Preis der Tourenwagen on July 9. The poster is in VERY good condition but does have a couple of pinholes in the corner and has been folded three times (original folds!). The poster measures approximately 59 x 86 cm or some 24 x 34 inches. It shows a GREAT image an Alfa Romeo GTA negotiating a bend with "2 feet off the floor"!